Rumor: Special Edition R2-D2 DROID 2 in the Works? August 12th a Possibility? We thought the news we broke this morning that the Droid 2 will likely have Android 2.2 at launch was big, but after you check out the photo above, your mind will be blown. 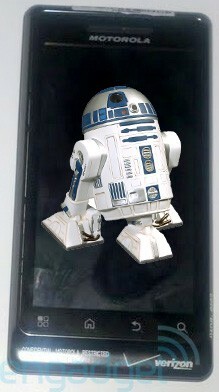 Rumor has it that Verizon plans to launch a special edition R2-D2 version of the D2 along side the stock version. We have no idea how many they’ll have or when they’ll be available, but this is pretty fun news to say the least. There is also a good chance that August 12th will be the launch day.